PALM DESERT, CA - For students in kindergarten through senior high school, back-to-school usually means heading out to a retail oulet to purchase supplies. This can be a financial burden on many Coachella Valley families, so KDI Kares held a month-long "Backpack Drive" benefiting the Jordan Outreach Ministries to help those in need. 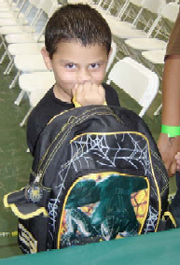 The "Backpack Drive" yielded 160 school-supply filled backpacks, which were distributed to students on August 25, 2007 at the Jordan Outreach Ministry Center in Coachella. "Seeing the happiness on these students' faces when they were handed a backpack was heartwarming," said KDI Kares volunteer, Suzanne Zens. "This event really made a difference to these families in need." The new backpacks and supplies were donated by KDI Elements employees, vendors, clients and suppliers along with Wal-Mart, CDS Office Products, Alliant Insurance, Dal Tile, Richard Marshall Olde Boards, Sunshine Stationery and The American Heart Assocation. KDI Kares exceeded their goal of distributing 100 filled backpacks this year and plans to make the "Backpack Drive" an annual event. KDI Kares is the non-profit arm of KDI Elements, which is one of the largest employers in the desert. The organization reaches out to charities and the needy of the community. For more information on KDI Kares (a non-profit 501 (c) (3) corporation) visit www.kdikares.com or contact Pat Shapiro at 760.345.9933.
to students at the Jordan Outreach Ministry Center in Coachella. were "excited and appreciative," according to event volunteers.